REUTERS/Gary CameronSen. Harry Reid (D-Nevada). Sen. Harry Reid (D-Nevada) and the Senate Democratic leadership wrote a letter to President Barack Obama on Monday wherein they strongly endorsed his planned executive action on immigration reform. “[W]e fully support your decision to use your well-established executive authority to improve as much of the immigration system as you can,” they wrote. 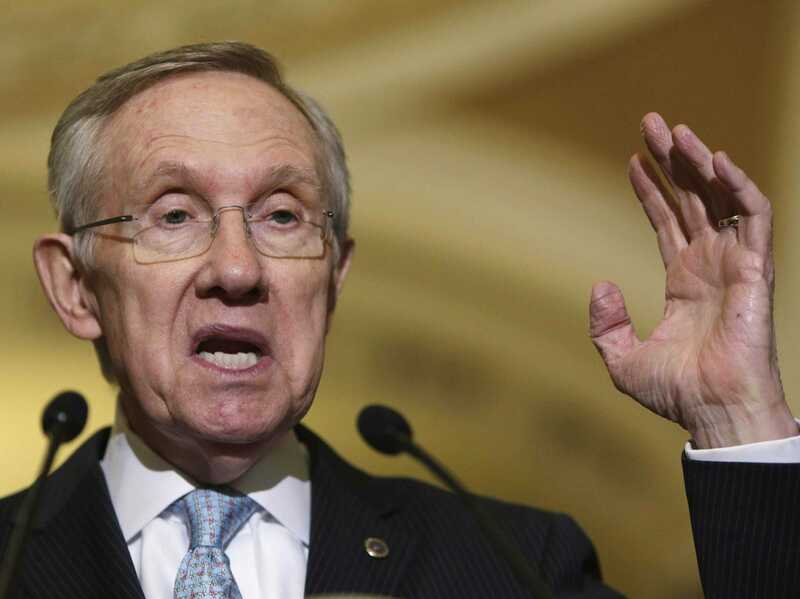 The letter — circulated by Reid’s office and signed by fellow Democratic Sens. Richard Durbin, Chuck Schumer, Patty Murray, Bob Menendez, and Michael Bennet — further urged Obama to take on specific policies like expanding the “DREAM” program that provides permanent residency to immigrants brought here as children to include other undocumented immigrants with strong US ties . The Democrats also pushed back on Republican who have claimed Obama will be breaking the law if he issues the executive order. They cited past presidents who have also implemented executive actions related to immigration and argued Obama has “broad executive authority” on the matter. “Some Republicans are claiming that you do not have the authority to act, but we know that you, like previous presidents, have broad executive authority to shape the enforcement and implementation of immigration laws. This authority includes exercising prosecutorial discretion to refine deportation priorities, deferring deportations on a case-by-case basis, and streamlining the legal immigration system,” they wrote. View the full letter below. As you know, it has been more than a year since the U.S. Senate passed a common sense immigration reform bill with strong bipartisan support. Like you, we are greatly disappointed and frustrated that House Republicans failed to take up immigration reform legislation. The Senate’s bill would reduce the federal deficit by nearly a trillion dollars over the next two decades. It would protect and unite families, strengthen our national and border security, improve our economy and protect American workers, and encourage job creation and job growth in the United States. We know that enacting a comprehensive immigration bill is the only way to permanently fix our broken immigration system. The Senate-passed bill would overwhelmingly pass the House of Representatives. Because House Republicans have not acted, we fully support your decision to use your well-established executive authority to improve as much of the immigration system as you can. Some Republicans are claiming that you do not have the authority to act, but we know that you, like previous presidents, have broad executive authority to shape the enforcement and implementation of immigration laws. This authority includes exercising prosecutorial discretion to refine deportation priorities, deferring deportations on a case-by-case basis, and streamlining the legal immigration system. In fact, every President since Eisenhower has used his executive authority to make our immigration system function more effectively. Perhaps the action most similar to what is needed today is the “Family Fairness” policy implemented by Presidents Ronald Reagan and George H. W. Bush, which deferred the deportation of 1.5 million spouses and children of individuals who were legalized under the Immigration Reform and Control Act, representing 40 per cent of the then undocumented population. Many of us sent you a letter two years ago requesting that you consider granting deferred action to young immigrants known as the DREAMers. We thank you for the highly successful action you took to grant deferred action to these individuals who came to the United States as children. More than 600,000 have been approved for deferred action and are now able to more fully contribute to this nation they call home. We hope that your upcoming actions will expand on this program to include individuals with strong ties to the United States and who have not committed serious crimes, including the parents of these DREAMers, U.S. citizens and lawful permanent residents, and workers who play a vital role in our economy and heritage. Deportation relief will help the economy, American workers, and employers by increasing payroll tax revenues by billions of dollars. In addition, it will bring undocumented workers out of the underground economy, which undercuts wages and labour protections for Americans and gives unscrupulous employers an unfair competitive advantage. We also hope that you will take actions to make immigration and border enforcement more effective, humane, and non-discriminatory. Such steps as revising the Department of Homeland Security’s civil immigration enforcement priorities, and prosecutorial discretion guidance and refining Secure Communities to prioritise those who are convicted of serious offenses will help focus on threats to public safety and not individuals with only immigration-related offenses or minor offenses. Lastly, we hope that you will improve the legal immigration system to keep immigrant families together, protect workers, and allow employers to sponsor more talented immigrants for U.S. citizenship. Immigrant communities have waited too long for House Republicans to catch up with the American public’s support for comprehensive immigration reform. We strongly support your plan to improve as much of the immigration system as you can within your legal authority, and will stand behind you to support changes to keep families together while continuing to enforce our immigration laws in a way that protects our national security and public safety.